Veterans from the second world war recently visited Oakwood Infant and Nursery School to speak to the children about their service and share their knowledge. The special service, part of a Remembrance Day commemoration, was arranged to show the children the importance of events during the war and to help them understand why they should mark the anniversary of the end of the war. Veterans and children both joined in to sing “Wish Me Luck As You Wave Me Goodbye” and “We’ll Meet Again”. After the service, children were shown a specialist army vehicle and taught the origin and significance of the poppy. The war heroes also talked about plaques which the wives of fallen soldiers were given, as well as letters veterans received from King George V.
Pupils and veterans then joined in lunch together. “Our veteran visitors enjoyed sharing their stories with the children, being involved in lots of activities and making lots of memories,” said catering manager, Debra Fairhead, to Clacton Gazette. 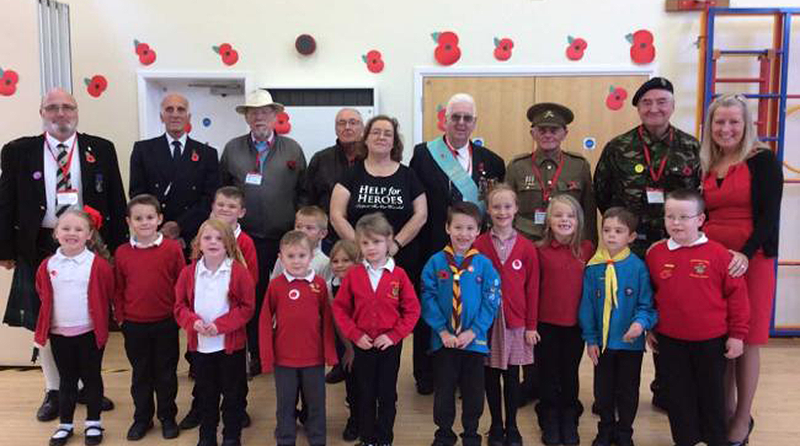 “The veterans were impressed with the children’s impeccable behaviour. The event was arranged by Rev. Sean Fountain, who led the service, alongside Ms Fairhead and the catering team.